Creamy No-Boil Macaroni and Cheese - cottage cheese, milk, dijon mustard, cayenne, nutmeg, salt, pepper, sharp cheddar cheese and macaroni - Everything cooks in the same pan, even the pasta! Can make the cheese mixture ahead of time and add noodles right before baking. 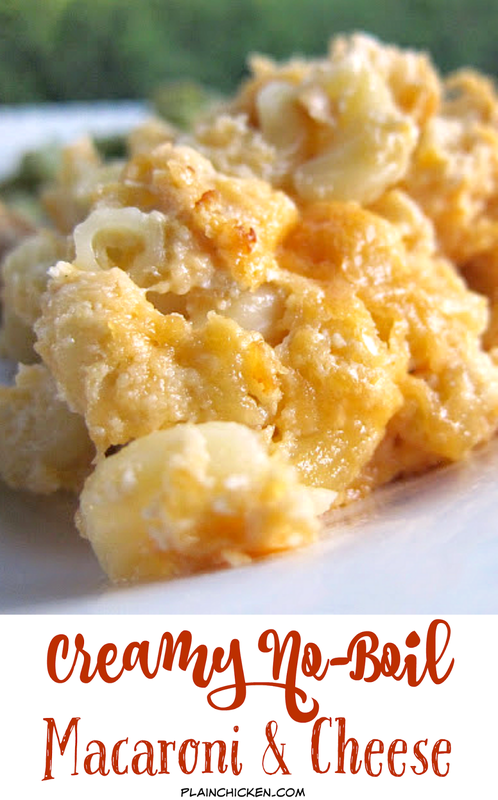 Our FAVORITE Mac and Cheese recipe! Mac and cheese is one of my favorite side dishes. I believe we actually consider it to be a vegetable in the South. I found this recipe on the New York Times website. It caught my eye because it uses cottage cheese and it doesn't require the noodles to be precooked. I mixed up the cheese mixture the night before and just added the noodles right before I baked it. It was so simple to make and it tasted delicious! It tasted just like Southern macaroni and cheese is suppose to taste. Don't worry if you don't like cottage cheese; I couldn't taste it. It just added a really nice creaminess to the whole dish. Preheat oven to 375ºF. Lightly spray a 9-inch pan with cooking spray. Set aside. In a food processor or blender, purée cottage cheese, milk, mustard, cayenne, nutmeg and salt and pepper together. Reserve 1/4 cup grated cheese for topping. In a large bowl, combine remaining grated cheese, milk mixture and uncooked pasta. Pour into prepared pan, cover tightly with foil and bake 30 minutes. Uncover pan, stir gently, sprinkle with reserved cheese. Bake, uncovered, 30 minutes more, until browned. Let cool at least 15 minutes before serving. Wait. I'm confused. Are you saying everyone doesn't consider it a vegetable?? :) Can't wait to try this! In my family it is acceptable as a veggie .. that way you can serve it with mashed potatoes on the menu, too! I feel sorry for those who are unaware of macaroni and cheese as a vegetable. Poor things don't know what they're missing. This looks delicious, it's been pinned. Wow Steph I love this recipe. Going to try it tonight. Its easy yet looks and sounds so good. Thanks for sharing. Also loved your fajita wraps. I'm a bit behind in reading my email posts and am just catching up. Everything you do on here is a winner!!! A veggie! I love it. This looks great, I always have cottage cheese in the fridge. Can't wait to try it. I love simple recipes. Cant wait to try this one out! Intriguing! I love that you don't boil the noodles, and that you call this a vegetable. That my dear is a win-win! Just out of curiosity, what will happen if this is made with low fat cottage cheese and milk? Will the results vary too greatly? Lilly's Mommy - I used 1% milk and 4% cottage cheese. The pan size is 9-inch square and you bake it at 375. You can half it. You would need a small dish - maybe a 5-inch dish. Steph - do you think I could use ricotta instead of cottage cheese? Leeci - I think ricotta would work. Let me know how it turns out. I made this with sundried tomatoes and spinach- it is amazing! Thanks for the recipe. Great additions! So glad you liked it! I wonder how this recipe would fare using gluten free pasta... would be curious if anyone has tried it. May I ask how many servings does this make? May I know how many servings this would make? Thanks for this amazing recipe. Another good one!